Maker’s Mark is one of the big boys of the bourbon world. I have a lot to say about it. Since this is a longer than average review, I have added links for you to jump to each section of my write-up. Maker’s Mark — the only big fish in the small pond of Loretto, Kentucky. Dominating a town with a total area of only 3.5 miles, the Maker’s Mark distillery is probably the reason they get their own zip code. Make no mistake about it, Loretto is a company town, intensely proud of their single product. The very first bottle of Maker’s Mark was introduced in 1958, at the luxury price of $7 per bottle. A masterpiece crafted by Bill Samuels Sr., Maker’s Mark is distinguished by its red wax seal, and, of course, by it’s notably sweet taste. Mrs. Samuels was a fine pewter collector, thus always in search of “the mark of the maker”. She also collected bottles of cognac, many of which were often sealed in wax. These two hobbies inspired her to suggest both the name and the emblematic red wax dip. After countless experiments in the family kitchen, Bill Samuels, Sr. concluded that the recipe should use gentle winter wheat as the flavor grain, instead of the traditionally used rye. This provided a sweeter flavor with no trace of bitterness or heavy spice. Though six years is a fair estimate for the typical age of each finished barrel of Maker’s Mark, there is no predetermined aging time like many other brands of bourbon. And thus there is no aging claim printed on the bottle. Instead of having an expiration date at the warehouse after a certain number of years, Maker’s bottles based on taste. Warehouse personnel also routinely rotate barrels of aging bourbon from the top floors of the warehouse to the bottom to benefit from the difference in temperature and improve consistency in the aging as the seasons change. As the barrels reach maturity, each must be approved by expert tasters before its contents are poured. The final product is bottled at 90 U.S. proof (45% alcohol by volume). 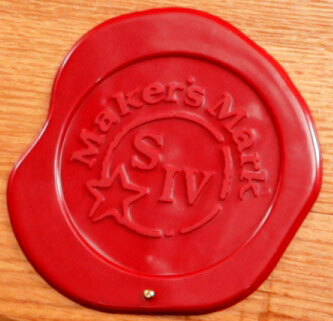 Workers hand-dip the bottle in red wax, giving each bottle of Maker’s its signature finish. Maker’s Mark is the most well-known of the “wheater” bourbons — the others being the Old Fitzgerald, Weller, and Van Winkle lines. Wheated bourbons, where the 2nd grain (also called the “flavor grain”) is wheat instead of rye, are generally smoother and sweeter than their traditional rye-based brethren. The old Maker’s Mark slogan, “It tastes expensive… it is”, was very successful in the 1960s. The Samuels family was brilliant in predicting, if not creating, the premium bourbon boom, however their whiskey now comfortably sits in the middle of the pack as far as price goes. Today, depending on where you shop, you can usually get a 750mL bottle for around $24-$28. While it is priced slightly higher than some of its middle-shelf competitors now, Maker’s Mark provides great value for its quality and consistency. Another building block of the Maker’s brand is its Ambassador program. By creating a team of missionaries for Maker’s, Bill Samuels’ team has smartly built an informal sales force of fanatically loyal customers, who eagerly push Maker’s on to their friends and family. Very few companies work to inspire that kind of loyalty, and that’s just smart business if you ask me. Also, their distillery tour is unparalleled in its sophistication, breadth, and entertainment value. They have built what might be called a bourbon amusement park. It is always the first stop I recommend for anyone planning to do a tour of the Bourbon Trail circuit. And if you’re ever in Louisville, KY, the Maker’s Mark Bourbon House & Lounge deserves a visit. In addition to featuring an entire wall of backlit Marker’s Mark bottles, it also showcases an impressive selection of bourbons from many other Kentucky distilleries. Because Maker’s Mark does not release a single-barrel or long-aged bourbon, these special bottlings are generally the only collectible Maker’s products you will find on the shelf. But when they’re released, you better hurry! Each time a new commemorative bottle is released, it is the talk of the town, and they are snapped up fast. The folk at Maker’s Mark make a solid bourbon, but they sit at top of the heap when it comes to building a brand — they are marketing geniuses in my book. The nose has subtle hints of fruit and caramel, anticipating the sweetness you will find in the first sip. The palette adds a deep molasses element and no hint of bitterness. The short and sweet finish is smooth and almost too abrupt. It is a simple but pleasant whiskey, one where you know what to expect and won’t feel too challenged. Think of it like a comfort food, a trusty old friend, if you will. I consider Maker’s Mark to be a staple for any bourbon shelf. For many, it serves as a gateway into the wide world of bourbon. It is readily available, an iconic, well-recognized brand, consistent in quality, and provides an easily accessible drinking experience due to its sweet, smooth flavor. If you are new to drinking bourbon or looking for a good choice to serve to non-whiskey drinking guests, Maker’s is one of only a few whiskeys you absolutely must have. For old-hands, Maker’s sometimes is described as boring or uninspiring. For me, I once felt that way due to developing a taste for more traditional rye bourbons. I will say, however, as I have moved past bourbon drinking adolescence, I have re-developed a fondness for Maker’s Mark. I know what to expect, I know I can always find it. It’s trusty. It’s reliable. And it’s good. While I hesistate to rate bourbons, since I feel there are very, very few bad bourbons on the market, I know some of you have asked me to start doing so. So to put a number on it, I rate Maker’s an 85 / 100. Was Maker’s also your gateway bourbon? Is it still a staple for you? Let us know what you think by leaving a comment below. If you’re thirsting for a bottle of Maker’s right now, just click here to buy now and have it on its way. Looking to buy collectible Maker’s Mark bottles? Check the eBay listings below. You can follow any responses to this entry through the Comments RSS 2.0 feed. You can leave a response, or trackback from your own site. I believe your review accurately depicts the Makers brand. I lean toward wheated bourbon’s but do have a fairly sizable combination of both wheat, rye bourbon and rye whiskey’s. For new bourbon drinkers, I recommend Makers. I do this to get them started with a bourbon that is not complex, it’s easy on the palate, and minimal burn which is the turn off point for many new drinkers. Makers is good neat or as a mixer. Makers is one of those stable and predictable bourbons that I keep in my closet for those times I need such a drink. Typically though, my tastes gravitate toward more complex bourbons. I love Maker’s Mark. I’m one of their Ambassadors and I have a barrel that I share with some 8 other people. I think Maker’s is the best affordable bourbon on the market. That is, I don’t think it’s the best bourbon in the world, but it’s the best I can afford to buy regularly. Personally, my all time favorite bourbon is a Pappy Van Winkle Family Reserve aged 19 years that I’ve been fortunate to have 2 separate occasions. The last time I had the Pappy Van Winkle, I found out my girlfriend had cheated on me. Yet, when I�m asked about that evening, I view it as a great time because of the wonderful meal and exceptional bourbon I had that night. Now that�s good bourbon � one that makes infidelity a distant afterthought. There are many great mid to low shelf bourbons that are worth a try. As I’ve stated in a couple of posts, wheated bourbons are my preference therefore, if you haven’t already, try Old Rip 10 year 107; Old Weller Antique 107, Very Old Barton BIB, or if you can find it, Ancient Ancient Age 10 year 86p. All these range in price from $12 to $25 and are excellent pours. Not that you are, but as a general rule, don’t be afraid to explore the mid to lower shelf offerings…there are a number worth purchasing. I never really liked Whiskey. I read a review of Makers Mark and thought I would give it a go. I was not disappointed. I very much enjoyed the smoothness of this bourbon. I had previously never tried bourbon, but I do believe I will be doing the rounds of the wheated bourbons (not really a rye fan). If you see errors instead of a list of bottles, I apologize -- the eBay feed is malfunctioning. Try reloading the page once or twice, or clicking here to see the listings. Sorry!